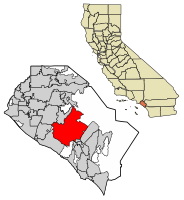 Irvine (pronounced /ˈɜrvaɪn/) is a city in Orange County, California, United States. It is a planned city, mostly made by the Irvine Company since the 1960s. The city was formally incorporated on December 28, 1971. The 69.7 square mile (180.5 km2)[source?] city has a population of about 212,793 (as of January 1, 2009). It has united in the past a green belt or greenbelt is a policy and land use designation used in land use planning to retain areas of largely undeveloped area to the north, and has also united the former El Toro Marine Corps Air Station, most of which is planned to be converted into the Orange County Great Park. 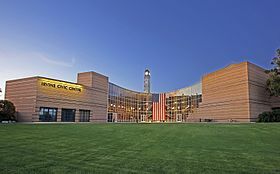 The University of California, the highest level of the state's public higher education system, has a campus in Irvine. Irvine is part of the Greater Los Angeles Area. ↑ 2.0 2.1 "Irvine". Geographic Names Information System. United States Geological Survey. Retrieved November 6, 2014. ↑ "City Charter". City of Irvine. Archived from the original on October 7, 2014. Retrieved October 9, 2014. ↑ "City Manager". City of Irvine. Archived from the original on October 26, 2014. Retrieved October 12, 2014. ↑ "City Council". City of Irvine. Archived from the original on April 3, 2015. Retrieved December 14, 2016. ↑ "Demographics Information". City of Irvine. Archived from the original on March 17, 2015. Retrieved January 3, 2017. Wikimedia Commons has media related to Irvine, California. This page was last changed on 23 February 2019, at 22:33.